Need dessert for your next potluck? Our PHILADELPHIA Lemon-Maple Cheesecake is just the kind of recipe you've been searching for. 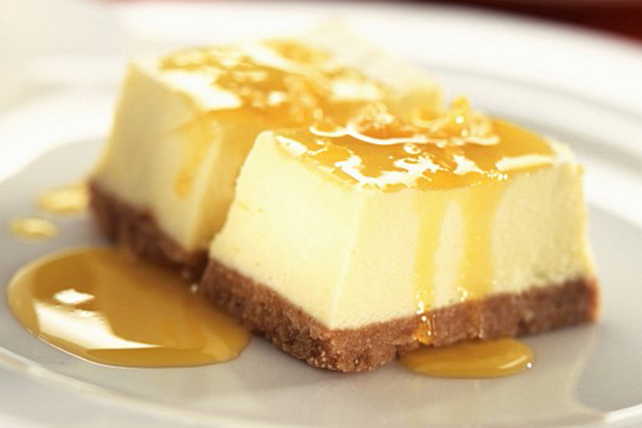 A creamy cheesecake with a sweet and tangy drizzle and 20 servings - problem solved! Line 13x9-inch pan with foil, with ends of foil extending over sides. Combine graham crumb and margarine; press onto bottom of prepared pan. Refrigerate until ready to use. Beat cream cheese and sugar in large bowl with mixer until blended. Add vanilla and 1 Tbsp. lemon zest; mix well. Add eggs, 1 at a time, mixing on low speed after each just until blended. Pour over crust. Bake 45 min. or until centre is almost set. Cool completely. Use foil handles to lift cheesecake from pan just before serving. Microwave maple syrup in microwaveable bowl on HIGH 1 min. or just until warmed; stir. Drizzle over cheesecake; sprinkle with remaining zest.